The backside of the Sierra is littered with amazing scenery, hot springs, rock climbing, and everything an outdoor enthusiast needs. Near Bridgeport, CA, are the Travertine Hot Springs. While they can be crowded, this place is beautiful. The natural rock formations really make an amazing hot springs environment. Just south, on 395, near the Mammoth Airport is a green church. If you take that road, it will take you to the Whitmore Hot Springs Area. There is a high concentration of man made hot springs that vary from warm to hot. While we haven't been to all the hot springs in this area, we have been to most. Our favorites are the Rock Tub, for best views, and Shepard Hot Springs, for the perfect temp. A great short hike to a crater that was formed from a hotspot and is actually part of some of the youngest volcanic mountains in the US. The Panum Crater is full of Obsidian and Pumice and is a great place to hunt for earth treasures. This is some of the best BLM camping in California. Alabama Hills are littered with rocks, climbing routes, a few bouldering spots, and plenty of scrambling. 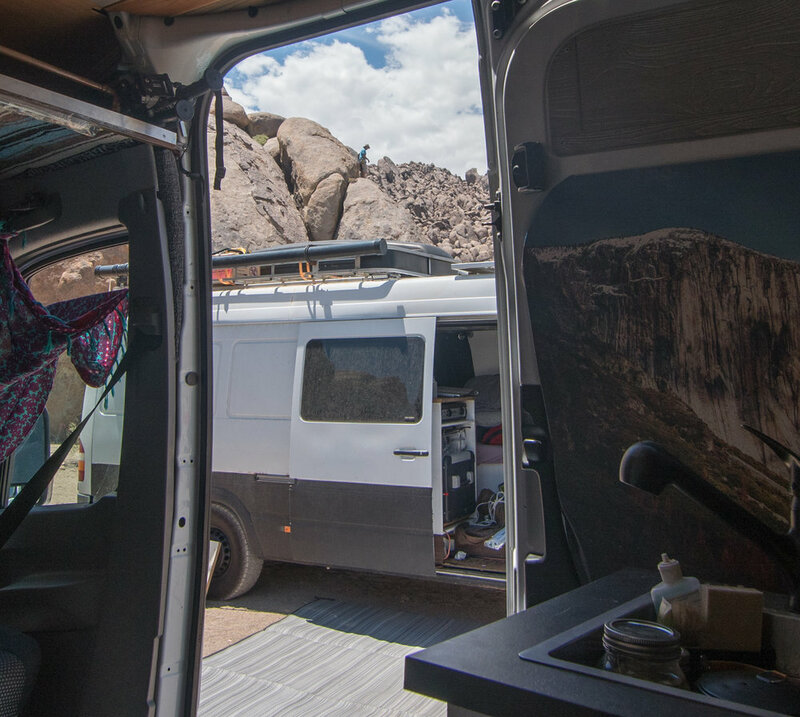 This place is vanlife heaven. A great place for beginners to start climbing in Alabama hills is at Paul’s Backyard, for a variety of easier climbs. We actually camped at Paul’s Backyard and left our ropes up for a few days and climbed as we pleased. If you are ready to step it up a few notches, the Shark Fin is a iconic climb in the area as well. There are hundreds of routes at this world class climbing playground.